Take a look at our current ​Limited Time Offers! 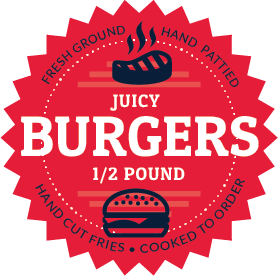 Our fresh, half-pound, never frozen hand-pattied burgers are all served on a brioche bun with mayonnaise, lettuce and tomato. All burgers are served with fresh hand-cut fries. Fresh half pound burger grilled to order. Fresh half pound burger grilled to order and topped with pepper jack cheese and fried jalapenos. Fresh half pound burger grilled to order and topped with American cheese, homemade chili, coleslaw and grilled onions. Fresh half pound burger grilled to order and smothered with sautéed mushrooms & Swiss cheese. Delicious half pound fresh burger patty cooked to order and topped with lettuce, tomato, bacon, American cheese, fried pickles, and mayonnaise. Wine can be purchased by the glass or by the bottle.